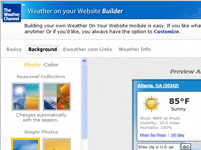 Enhance your site or blog with accurate weather from The Weather Channel® for any location worldwide. It's fast, easy & free! Utilize the MapQuest LinkFree program to link directly from your Website or Blog to specific maps or directions on the MapQuest.com website. Download The Weather Channel iGoogle Gadget, Windows Vista Sidebar Gadget, Mac Dashboard Widget, or the News/Breaking Weather Widget from The Weather Channel Gadget Gallery. Add a weather widget to your site or blog from The Weather Channel ® for any location world wide. It's fast, easy & free! Create a widget now - It's Free! 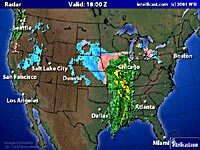 Give your Web site visitors easy access to current conditions and weather forecasts from The Weather Channel. Sign up today and we'll send you the code to add The Weather Channel logo to your Website. Get real-time weather reports based on your vehicle's current location through the OnStar? Virtual Advisor (a feature included with OnStar Personal Calling). Sign Up Now! Sign In! Want more customizable weather data and graphics solutions? Purchase a fully customized solution to fit your Web site's look and feel and localized to fit your desired specifications provided by Intellicast.com, our sister company.